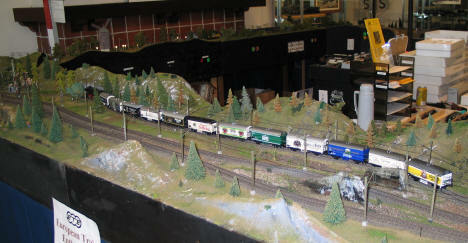 The European Train Enthusiasts display, which will be present during May. 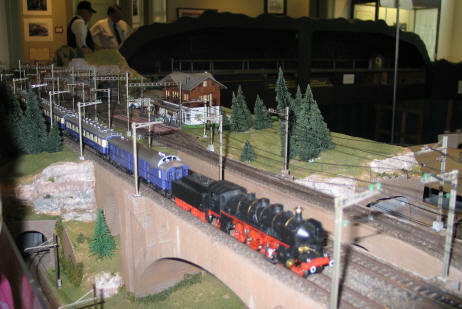 This is a multi-level HO scale model railroad that is computer controlled. There are both standard and Narrow Guage track and trains running. 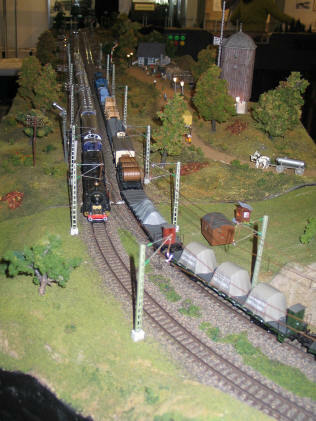 Normal model trains work by DC with the controller varying the voltage on the rails. The train engine has a standard DC motor, with the speed determined by the voltage on the rails. These trains run on AC, with the voltage being constant on the rails. The controller sends a digital signal to the engine, which has electronics to receive the signal, and sets the trains speed according to the commands. The signals are received on a "third rail" which is not an actual rail, but contacts in each plastic tie. An actual third rail would not look realistic. The contacts on the ties are almost invisible. The computer senses where the train is, and will stop the train if the signal is red. The operator can switch the signal, allowing the train to continue. 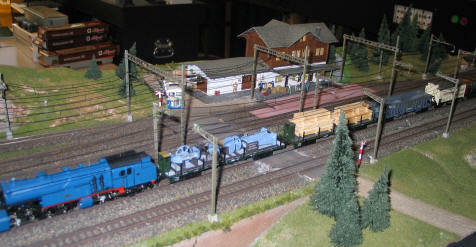 Two trains crossing at the back of the layout. 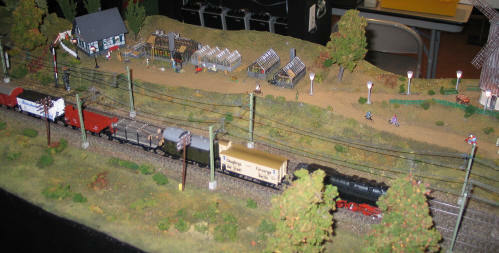 A train goes by greenhouses at the back of the layout. A train waits for the signal to tell it to continue.